straight toque with tami,eh? 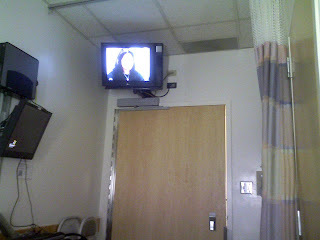 : A View From My Hospital Bed...part 2. I have a little game for you. Have you ever read People magazine and noticed they always have two pictures that appear to be identical but have been altered a bit so that the looker has to find all the things that are different from picture one to picture two? (Whew! What a long sentence) Anyway, that is what I've done for this post. 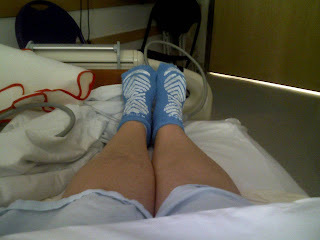 Remember the pictures from my hospital room that I posted last time? Well I took pictures of the same spots. See if you can tell what the differences are...isn't this fun?? Isn't it?? What used to be a nice, clean shelf is now a mess. It has become home to a bag of Boulder potato chips from Sunflower market (thanks, Erika). A delicious raisin cookie (Thanks, Terry). 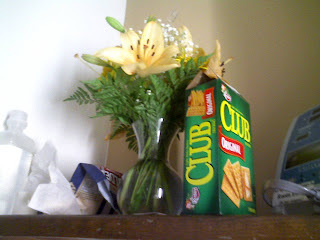 A big box of Club crackers (Thanks, Kathe). 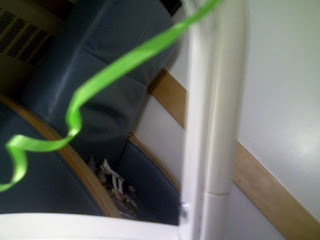 And, various monitors and gauze pads. Of course the flowers (Thanks, Amelia Earhart staff) are still beautiful although starting to show their week long stay. Did you figure out what's missing? working very well, WHEN I GET THEM ON TIME!!! This picture isn't that hard to figure out. There are two things that are different. 1. There is a different show on tv. It's "The Biggest Loser" rather than "Tyra". I also might add that I'm so sick of tv I can't see straight. 2. The door is shut. This picture takes a lot of courage to post since my shins look so huge. But, it had to be done. This one is easy too. 2. My pump up leggings are off and to the side...shhhhhhhh, don't tell Dr. Soissen. I'd be in big, big, trouble. No sleeping boyfriend this time. He had gone home for the night. But, If you look closely, you will see a creepy indented face on the vinyl chair back. I think of Grimace the McDonald's character every time I see that empty chair. With any luck, I'll be home today. I miss your red piggies in the feet picture. I hope you can go home soon. Love you! Yay for going home! I hope you get to sleep in your own bed very very soon. I got them all right! Woo hoo... What did I win? Also... Yay! You're coming home today!! Woo woo woo! 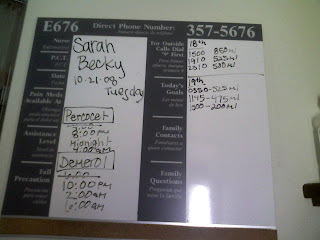 We should be blog friends, cause I read your blog all the time..... :) Hope you get to go home soon! Awe Thanks Goldie! I'll put your link on mine. Your writе-up has established beneficial to me. It’s very еԁucational and уou're simply naturally extremely knowledgeable in this field. You have got exposed my own eyes to be able to different thoughts about this particular subject along with interesting and strong content material.